This is a demo version of a non-trading expert, which utilizes so called the custom symbols feature (available in MQL as well) to build renko charts based on historical quotes of selected standard symbol and to refresh renko in real-time according to new ticks. Also it translates real ticks to the renko charts, which allows other EAs and indicators to trade and analyze renko. Place the EA on a chart of a working instrument. The lesser timeframe of the source chart is, the more precise resulting renko chart is, but the lesser number of boxes will be generated. This is so because available history is limited by the constant Max bars in chart in the terminal settings. The larger the source timeframe is, the deeper history is used for renko generation, but the lesser quality it has. This reduced accuracy of renko affects only regions generated from history, but all live changes of quotes (provided RenkoChartsDemo is running) generate absolutely accurate boxes - even more accurate than generated from M1 history. 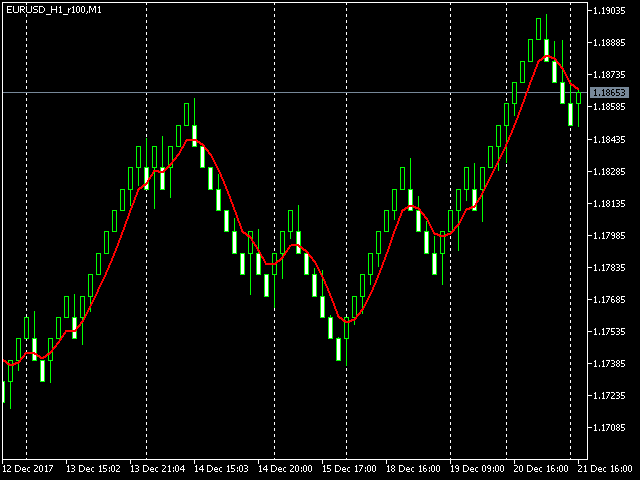 The generated renko chart uses M1 timeframe. The start time of a "minute" bar corresponds to the start time of renko box. The end time of a such "minute" bar is dummy (MetaTrader does not allow for bars with different timespan), instead you should look at start time of the next "minute" bar. It makes no sense to switch the renko chart to a timeframe other than M1. where i - number of a current bar being processed on the source timeframe (the numbering goes from maximum to 0), and N - total number of bars. where 100pt is the renkobox size in points, EURUSD_M1_renko is the custom symbol name (for both see description below), and 10 000 is total number of generated boxes (if the EA is running the very first time, this is actual number of renko bars, but if it continues from some previous results, for example, after the terminal restart, the number of new boxes can be a few, because only most recent, missing boxes are generated). RenkoChartsDemo opens one renko chart for you, but you can open more. RenkoChartsDemo generates custom symbol quotes, thus you may open many charts with it and apply different trading EAs and indicators. It makes no sense to run multiple RenkoChartsDemo with the same work symbol/timeframe/renkobox size. It is not allowed to run multiple RenkoChartsDemo with the same custom symbol name. Due to technical limitations in MetaTrader 5, renko charts can demonstrate strange behavior under some circumstances. You may find details in the Comments section of the full version. RenkoChartsDemo works with EURUSD M1 only. The utility does not work in the tester. CloseTimeMode - when true, boxes are shown and formed at M1 close time; in this mode, only one tick is generated per box, when box is added completely formed to a chart; by default - false, i.e. boxes are created at M1 open time. Fixed an error leading to propagation of renko boxes.